From time to time, we hear talk about the coming of the Antichrist and what he will bring about among people and in the world. Indeed, there are those who would even determine the specific time period in which he would appear. Many people ask us about this subject, but the answers are to be found in Holy Scriptures, and especially in the Epistles of St. John the Evangelist, the Apostle Paul, and the Revelation of St. John, and in all of the pastoral practice of the Church. In what follows, I would simply like to make some suggestions, primarily on how one is to deal with this situation. 1. In his First Catholic Epistle, St. John the Evangelist speaks about the coming of the Antichrist, and also about the activity of antichrists; indeed, he writes to the Christians that the hour is at hand. “Little children, it is the last time: and as ye have heard that the antichrist shall come, even now there are many antichrists; whereby we know that it is the last time” (I John 2:18). Just as there were Prophets before the coming of Christ, so, also, before the coming of the Antichrist, his own forerunners, the false prophets, will appear. “They went out from us, but they were not of us; for if they had been of us, they would have continued with us; but they went out, that they might be made manifest that they were not all of us” (I John 2:19). “the majesty of the heavenly good things, the beauty of the noetic world, and the bliss and truly ineffable joy of the ages to come,” according to St. Nikodemos the Hagiorite. • Consequently, before the coming of the Antichrist, the forerunners of the Antichrist manifest themselves: that is, the various heretics, but also those Christians who, instead of living the life in Christ with purity of heart and true faith of mind, live with passions and weaknesses, without inner prayer or true faith in God. 2. St. John the Evangelist, however, does not confine himself to speaking about the Antichrist and his forerunners, but also speaks about how we must deal with the Antichrist and his forerunners. This is why, immediately following the previous lines, he writes: “But ye have an anointing from the Holy One, and ye know all things” (I John 2:20). In other words, Christians have received anointing from God and know how to distinguish between the energies of the Antichrist and antichrists and the energies of Christ. This does not come about by the reading of books, but by the anointing that exists in the heart and that teaches. that takes place during the Mystery of Chrismation through the Holy Myron, on the day of our Baptism. In what follows, in the same chapter, St. John the Evangelist once again states that the holy anointing received by the Christian at Holy Baptism teaches him to distinguish between truth and falsehood. “But the anointing which ye have received of Him abideth in you, and ye need not that any man teach you: but as the same anointing teacheth you of all things, and is truth, and is no lie, and even as it hath taught you, ye shall abide in Him” (I John 2:27). And, as is his wont, St. Nikodemos writes: “how and in what manner” does man remain unchanging with regard to the gift of the Holy Spirit? This happens when man abides steadfastly in the doctrines of Theology and of the Incarnate OEconomy, not just rationally, but also existentially. • Thus, whoever speaks about the Antichrist and his forerunners should make reference to all of the passages in St. John the Evangelist, and should specify primarily what St. John says about the manner in which we must confront the Antichrist and his forerunners. Christians distinguish true prophets from false prophets and Christ from the Antichrist only by the activation of Chrismation, which they have received from God and which works in their hearts. 3. The Apostle Paul, also, speaks about the anointing of the Holy Spirit, which is also called a seal. “Now He which stablisheth us with you in Christ, and hath anointed us, is God; Who hath also sealed us, and given the earnest of the Spirit in our hearts” (II Corinthians 1:21-22). It is most clearly apparent, here, that God is the One Who gives confirmation to Christians. He is the One that anoints us. Anointing is identified with sealing, and this is done by God, Who gives us the earnest of the Spirit in our hearts. If one examines other similar passages from the Apostle Paul to discover the meaning of the earnest of the Spirit and what it means for one to sing hymns and spiritual songs in his heart, then he will understand that this anointing and seal is noetic prayer of the heart, which is an expression of the love that man feels for God. The Name of Christ has been written on the person that has received the seal of the Holy Spirit. “And I saw another Angel ascending from the east, having the seal of the living God: and he cried with a loud voice to the four Angels, to whom it was given to hurt the earth and the sea, saying, ‘Hurt not the earth, neither the sea, nor the trees, till we have sealed the servants of our God on their foreheads.’ And I heard the number of them which were sealed: and there were sealed a hundred and forty and four thousand of all the tribes of the children of Israel” (Revelation 7:2-4). It is unambiguous, here, that the Angel who had “the seal of the living God” sealed the servants of God on their foreheads. “And I looked, and, lo, a Lamb stood on Mount Sion, and with Him a hundred forty and four thousand, having His Father’s name written on their foreheads” (Revelation 14:1). In other words, the saved, who stood with the Lamb–Christ–, had the Name of Christ and His Father written on their foreheads. And as the text then says, they sang a “new song” before the throne of God, the content of which they alone knew. • Thus, the sealing of Christians with the Name of Christ and His Father is bound up with the “new song”; that is, noetic prayer, which is unknown to people who have no experience of this condition. This anointing in the heart acts as illumination of the mind: as inspiration, as love for God, as prayer, as hope in eternal life, and as the earnest of the Spirit. The confession of the Martyrs and the martyrdom that follows is the activation of Holy Chrismation, by means of which the Martyr beholds God; this is why the martyrdom of the Saints is not a simple matter of a rational process, sentimental excitement, or an impetuous action, but it is the fruit of the vision of God and deification. When we commit some sin, however, then the anointing in the depths of our hearts is activated through repentance. In other words, repentance that is expressed as an inclination to change one’s life, as love for God, and as prayer, is the activation of the Grace of Holy Chrismation. This anointing, moreover, is activated by noetic prayer of the heart, which is the “new song” that is sung by those who are regenerated by the Holy Spirit. When a person, however, denies Christ, departs from the Orthodox Church, and adopts heretical confessions and religions, he then loses this gift. And when he returns to the Orthodox Church, he must once again receive the anointing of the Holy Spirit through the Mystery of Chrismation. • Hence, the Shepherds of the Church must not speak only about the Antichrist and his forerunners, but first and foremost they must help Christians to live in such a way that the Grace of Baptism and Chrismation is activated, by the keeping of Christ’s commandments and doctrines, by experiencing these in one’s life in an Orthodox manner, by repentance, and by inner noetic prayer of the heart, for in this way they will be able to distinguish between the energies of Christ and the energies of the Antichrist. Otherwise, they will confuse uncreated with created energies and, what is worse, they will regard the energies of the Antichrist as the energies of Christ, and vice versa. This discretion constitutes Orthodox pastoral care. And its essence is what is called the Hesychastic Tradition. All of those who are vouchsafed the anointing of their hearts by the Holy Spirit—that is, the writing of the Name of the Lamb of the Revelation and of His Father in their hearts — will escape from being sealed by the Beast of the Apocalypse and his father, just as they will escape his forerunners. This is the essence of Orthodox pastoral care, which is bound up with the Hesychastic Tradition of the Church. This is why the preservation of Orthodox monasticism is of great importance. Every alteration to the Hesychastic spirit of Orthodox monasticism helps the forerunners of the Antichrist to do their job well and deceive the people. 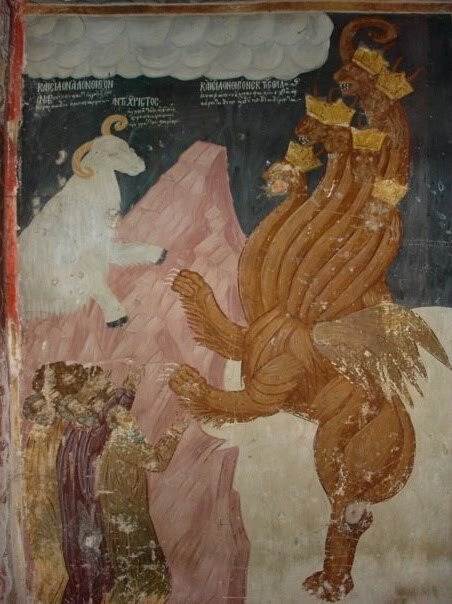 Source: Ἐκκλησιαστικὴ Παρέμβαση, Navpaktos, No. 122 (June 2006), pp. 1 and 8; Ὀρθόδοξος Τύπος, No. 1654 (4 August 2006), pp. 3 and 4.